Travel brochure "7 days cruise to Dalmatia," 1939. Published by the Dubrovačka Plovidba A.D., Dubrovnik. Brochure " In Terrasanta e a Cipro con il Lloyd Trestino," 1932. Signed "F. Romoli," printed by Barabino & Graeve - Genova." 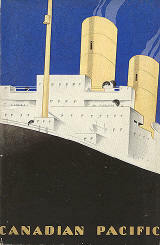 Booklet "Crociere - 1935," for the Italian Lines - (Italia - Cosulich, Lloyd Trestino, Adria). Designed by "Pizzi & Pizio - Milano." 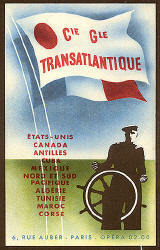 Booklet for "Canadian Pacific," 1930. Usigned. "ROMA" - The First Class. 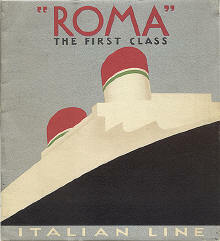 booklet for the Italian Lines, circa 1935. Signed "Bozzo & Coccarello -Genova." Inside view Advertisement for the Cie. Gle Transatlantique," circa 1937. By "Jan Auvigne." (Thanks to Nicho Lowry of Swann Galleries for the attribution). Brochure for the "Rotterdamsche Lloyd - Royal Dutch Mail" 1935. Signed "V. Stein," printed by "M. Wyt & Zonen - Rotterdam." 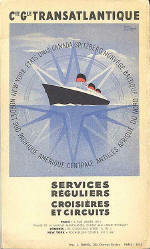 Advertisement "Cie Gle Trans-atlantique - Services Réguliers, Croisières et Circuits," 1937. Signed "Jan Auvigne."